Operation of sea going bulk carriers involved numerous hazards . Careful planning and exercising due caution for all critical shipboard matters are important . 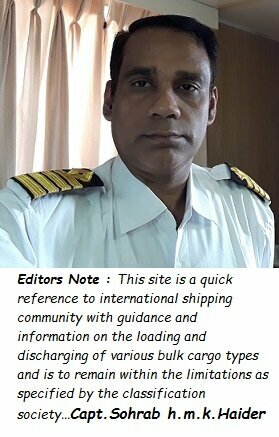 This site is a quick reference to international shipping community with guidance and information on the loading and discharging of various bulk cargo types and is to remain within the limitations as specified by the classification society. It is vital to reduce the likelihood of over-stressing the ship's structure and also complying with all essential safety measures for a safe passage at sea. Our detail pages contain various bulk carrier related topics that might be useful for people working on board and those who working ashore in the terminal. Solid bulk cargo means any material, other than liquid or gas , consisting of a combination of particles , granules or any larger piece of material, generally uniform in composition, which is loaded directly into the cargo spaces of a ship without any immediate form of containment. Example of such dry cargo are grain, sugar and ores in bulk. In its broadest sense, the term bulk carrier embraces all ships designed primarily for the carriage of solid or liquid cargo in bulk form, and so would include tankers. In ordinary usage, however, the term is normally used for those vessels designed for the transport of solid bulk cargos, typically grain and similar agricultural products, and mineral products like coal, ore, stone, etc., on one or more voyage legs. 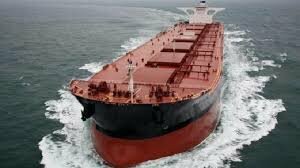 What is a bulk carrier ? "A ship which is intended primarily to carry dry cargo in bulk, including such types as ore carriers and combination carriers"
fore peak and after peak ballast water tank. The first reference source for the carriage of bulk cargo should be the International Maritime Solid Bulk Cargoes Code (IMSBC), issued by IMO. It was revised and reissued in 2009. It is a requirement that a copy of the Code should be onboard a bulk carrier, and the revised Code is mandatory under SOLAS from 1 January 2011.